Lately I have been deluged with the announcement of or introduction to a series of cloud based data management systems for design engineering that are also focusing on collaboration. I plan this blog to be the first in a series that explores new PDM/PLM (PxM) solutions for product design. Before I begin, we need to clarify the differences between PDM and PLM. PDM manages design changes during product development while PLM manages engineering and other changes made after the production release of the product for manufacturing and other downstream processes. Using this definition, PDM can be used to store all sorts of information during the design or work-in-process stage. Such information might include, but not be limited to: product specs, preliminary designs, analyses and simulation, product versions, QC specs, engineering BOMs, material types, etc. PLM manages engineering and other changes made after the release of the product from engineering. PLM systems might include PDM data managed during design as well as other data, such as, manufacturing BOMs, manufacturing instructions, NC data, service tracking, cost data, customer level documentation, etc. I think you get the picture. PTC’s recent announcement of PTC PLM Cloud, a webinar I attended about GrabCAD Workbench and Onshape’s inherent use of a cloud-based solution — all piqued my interest. I began wondering about the differences between them and how one might choose a solution for a mid sized firm. One obvious differentiator is how cloud based PxM software connects to CAD software, be it desktop CAD or cloud based CAD. By the way, if you have not seen Onshape’s Dave Corcoran’s blog about the “The blue screen of death,” then I urge you to read it now. http://www.onshape.com/cad-blog. Corcoran discusses some of the benefits of a cloud based PxM – CAD implementation. A PxM system cloud based system may not be much different from the tired old server based software that has been promoted for years. Adding a web based interface and hierarchical data storage in the cloud, masks an antiquated architecture. The old approach of bolting external data management software into CAD simply does not work well enough. It’s too laborious, takes extra time, and makes little use of design info developed automatically during the design cycle. It’s lack of adoption to date verifies this assumption. A true cloud based system should be radically different in architecture allowing full use of cloud system flexibility. For instance, one reason I always disliked the previous generation of PDM/PLM was their outdated reliance on text-based interfaces. I would expect modern PxM systems to be graphically oriented offering comprehensible and visual navigation within the product structure. It should offer a tight connection to related CAD systems and automate much of the data management function. Automatic backup and easy restore of historical data are mandatory functions, as are easily distributed design among partners along with IP (intellectual property) protection. The plethora of cloud based data management systems for engineering and CAD include the following (plus some I haven’t yet discovered): Autodesk PLM 360, Onshape, GrabCAD Workbench, PTC PLM Cloud, and Kenesto as well as Dropbox and related cloud drive systems. More traditional software is offered by ARAS, Dassault Systemes and Siemens PLM software. What follows is a summary of how some of these vendors are positioning their software. Onshape promotes distributed design. Using cloud based CAD along with a fully integrated cloud PDM system allows a brand new perspective on how modern CAD systems should work. Essentially all costs for compute power and data storage are greatly minimized, easily increased, even ”borrowed” for a short duration. GrabCAD’s Workbench calls itself “The fast, easy way to manage and share CAD files without PDM’s cost and hassle.” The company goes on to state “Workbench allows teams on any CAD system to work smoothly together by syncing local CAD files to cloud projects, tracking versions and locking files to prevent conflicts.” The enterprise version costs $89 per month. PTC recently announced PTC PLM Cloud, stating “this solution leverages the power of PTC Windchill, while simplifying PLM adoption with a flexible, hosted subscription offering, deployable at a pace that matches the needs of SMBs.” I am not exactly sure what this means, but expect to clarify this when I speak with PTC this week. Very soon, Kenesto plans to announce a cloud based system that, Steve Bodnar – VP of Strategy, calls a terrific solution for small shops, enabling them to replace their server based, in-house error prone, file based systems with a much higher function cloud based system that requires minimal change to the way CAD users work, yet improves the reliability of their data management. Alas, how can an engineering organization differentiate which PxM technology to buy and invest their time and money in? More detail about various implementations and my assessment of them will be forthcoming in future blogs. Ray Kurland — I have returned to consulting and analyzing systems for TechniCom, from an early and erstwhile retirement. If this is the case, then one might ask how does one use a design BOM to build an MBOM? Several alternatives come to mind. Rather than giving a dissertation on the subject, I spoke with Steve Chalgren, VP of Product Management & Strategy of Arena Solutions. The company, one of the earliest cloud based providers, provides only a cloud based solution. In fact, the company was at one time called BOM.com. Founded in the late 90’s, the company has grown to about 100 employees, with 500+ customers, and 15K to 20K users in 40+ countries. More than half of their customers are in the high tech electronics business. I had a chance to meet with the former founder soon after they were founded, but have not kept up with the company since then. A recent press release revealing that their net new subscriptions grew by over 25% in the first quarter piqued my interest. The company stated that the “increase in new business can be attributed to Arena’s 2011 investments in new products, like PDXViewer and PartsList, and integrations to cloud enterprise resource planning (ERP) solutions like SAP Business ByDesign and Netsuite, and component aggregators like Octopart.” My interest centers on possible use in the mechanical realm. BOMControl seems to offer much of the capability that mechanical design users need, including BOM management, import from CAD systems for creating the MBOM, and change management of the created BOM’s. Typical users might include the engineering team, document control managers, operations and manufacturing planning, supply chain management, and suppliers. 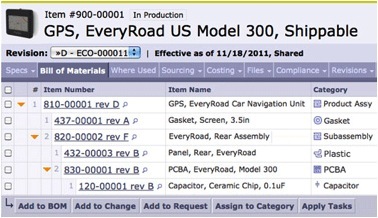 The software makes it easy to add and track items needed for manufacturing. The fact that it is isolated from engineering CAD systems and from internal PDM or PLM system seems to allow secure access into just those areas that suppliers need without concerns about intellectual property (IP). Allowing suppliers direct access to internal PLM systems always makes me nervous. The software seems to make sense for those companies that do not yet have or will not soon have a fully integrated PLM system for BOM management. And few do today. My guess is that many companies today use spreadsheets (like Excel) to manage their BOM’s, since most CAD PDM systems have little or no capability for multiple BOM views of the product, instead, focusing entirely on the engineering BOM, the EBOM. While spreadsheets will work for this application, they do not have the capabilities to easily collaborate, track changes, or smoothly interact with EBOMs to automate data exchange. 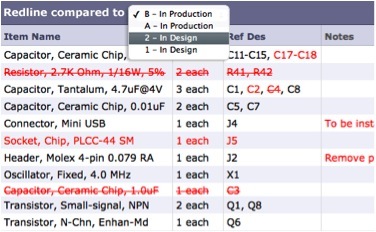 In the case of electronics manufacturing, an electronic search engine called Octopart automatically searches for the data associated with specified purchased parts and adds it to the MBOM. Capabilities exist for also adding these hooks manually and to include virtually any type of part descriptive files. Thus the Arean Solutions MBOM can become the residence not only of part data, but many other types of data associated with manufacturing. Consider test descriptions, supplier acceptance requirements, engineering test specifications and calculations as just a bit of what is possible. Shown below are two screen shots of BOMControl managing these exact processes. Arena Solutions offers a BOMControl basic plan for $49 per month for up to 3 seats. They also have a 30-day free trial. For more information see their website at http://www.arenasolutions.com/products/bomcontrol/plans/. This trial pricing program is competitive with Autodesk 360 PLM and considerably cheaper than PLM vendors. Arena Solutions’ products are aimed at taking the design EBOM and allowing a secure system for developing, maintaining, and collaborating MBOMs. All of which are needed to build and even service the eventual delivered product. All user companies without a current or short-term plan should definitely consider BOMControl. One might think that BOMControl is used only by smaller companies, yet this is not the case. A large proportion of Arena Solutions clients are large companies. I received no compensation for this review. All from a small – medium business point of view. The best way to get to the webcast is to go to www.ptc.com and search for “buyer’s guide”. Readers can get a copy of the white paper that goes along with this from the cad-portal.com website. Click here.